The JNV has issued School, District and State Level Chekumuki Science Test 2017 Notification in Andhra Pradesh. In this regarding, The Jana Vignana Vedika, a National Award winning voluntary science organization, is actively involved, for nearly three decades, in popularization of science among masses and school children and inculcation of scientific temper among them. 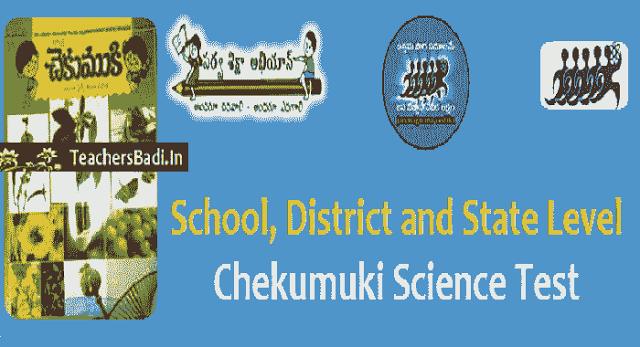 As you know, our organization is holding every year, a mega science event, known as "chekumuki science festival" at school, mandal, district and finally at state levels which consists of several fun science activities including quizzes and tests to promote knowledge of science among school children. - Encourage students to participate in the science festivities. - Give the opportunity to test the science knowledge. - There are 40 multiple choice questions on Physical, chemical, biological sciences, mathematics, contemporary sciences etc., in in school level. - Be successfull for science festivals. - Contact your JVV activists for question papers. This year, the school level Chekumuki Science Test will be conducted on 07-11-2017, Mandal level test on 17-11-2017, District level test on 09 and 10-11-2017 and finally, the state level festival on 5th, 6th and 7th January, 2017. The Government of Andhra Pradesh has given permission to hold this Festival and informed of all the District Educational Officers accordingly. The Chekumuki Science Festival is very unique and has won the appreciation of all science teachers and academicians. The JVV would request to all the schools, kindly hold the School level Chekumuki Science Test for students of 8th, 9th and 10th classes only on 07-11-2017 at your school in large members by collecting a nominal entry fee of Rs.5 per student. Kindly evaluate the test papers with key supplied and depute the best student in each class and to form a 3-Members School Team in each medium(Telugu and English) to participate in the next level, i.e., Mandal Level to be held at Mandal Head Quarters on 17-11-2017. Best team in each medium from both Government and Private Schools, separately at the Mandal Level, will be selected to participate in the District Level Science Test to be held on 09 and 10-12-2017 at the respective District Headquarters. Best Team, to participate in the State Level Test, in each medium from both Govt. and Private Schools, separately will be deputed to participate in the State Level Science Festival to be held on 05, 06 and 07 January, 2017.